(Nanowerk News) Organic molecules allow producing printable electronics and solar cells with extraordinary properties. In spintronics, too, molecules open up the unexpected possibility of controlling the magnetism of materials and, thus, the spin of the flowing electrons. 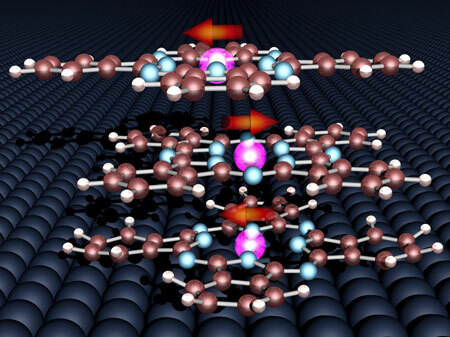 According to what is reported in Nature Materials ("Exchange bias and room-temperature magnetic order in molecular layers") by a German-French team of researchers, a thin layer of organic molecules can stabilize the magnetic orientation of a cobalt surface. “This special interaction between organic molecules and metal surfaces could help to manufacture information storage systems in a more simple, flexible and cheaper way,” explains Wulf Wulfhekel from KIT. Microscopic magnets with constant orientation are used in hard disks, for example. With a view to “printable electronics”, organic molecules indeed could open up new simple production methods utilizing the self-organization of molecules. In the present study, three molecular layers of the dye phtalocynine were applied to the surface of ferromagnetic cobalt. Whereas the magnetic moments of the molecules alternatingly align relative to the cobalt and relative to each other, the molecules form a so-called antiferromagnetic arrangement. The magnetic orientation of this combination of antiferromagnetic and ferromagnetic materials remains relatively stable even in the presence of external magnetic fields or cooling. “Surprisingly, the “lightweight” molecule wins this magnetic arm wrestling with the “heavyweight” ferromagnetic material and determines the respective properties,” Wulfhekel says. Systems of antiferromagnetic and ferromagnetic materials, among others, are used in hard disk reading heads. So far, manufacturing of antiferromagnets has been quite complex and time-consuming. Should molecules be suitable for use in the production, the antiferromagnets one day will simply come out of the printer. The present publication is the result of a cooperation of researchers from KIT, University of Strasbourg, and Synchrotron SOLEIL. First author Manfred Gruber was member of the German-French Graduate School “Hybrid Organic- Inorganic Nanostructures and Molecular Electronics”, where different aspects of nanoelectronics, spintronics, and organic electronics are investigated.